DSI4MTF, in its fourth year, has achieved important milestones. It has introduced new irrigation technologies, new cropping systems and facilitated collective farmers groups to implement the interventions. DSI4MTF adopts ethical community engagement (ECE) perspective in its implementation. The ethical community engagement perspective considers farmers as collaborators and partners and not as recipients of benefits. The implementation processes, impacts and outcome of the project are systematically monitored, analyzed and documented. It uses both quantitative and qualitative methods and tools to capture and analyze the processes and outcome. One of the important tools, being used, is case studies covering household, technology and engagement. In order to have uniformity in its approach DSI4MTF organized training, on case studies, for the project partners last (2017) summer hosted by CDHI, a partner in the DSI4MTF and SIAGI, another sister project. This helped partners develop conceptual and theoretical understanding on case study as a method. The annual meeting (2017) was organized in Cooch Behar during December 11-14, 2017. The annual meeting is an opportunity for the partners to share their progress and findings of various studies. Case study was used to present the progress in designated areas of household, technology and engagement. This was an interesting session which offered great insight and helped mutual learning. The session also helped to reflect on the application of training while preparing cases. Following the ethical community engagement perspective all the information gained from the community need to be shared with community before finally making the same public. This holds true for case study. The annual meeting offered opportunity to demonstrate how this could possibly be done. 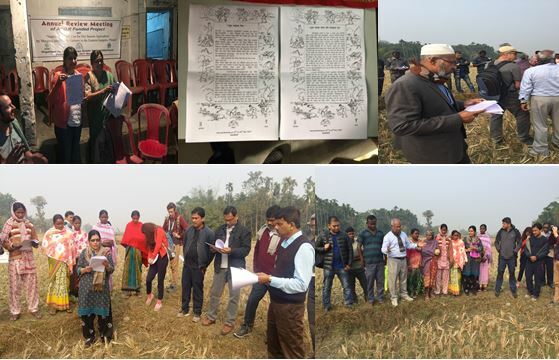 The CDHI team prepared two cases (presented using vernacular Bengali) from the project villages of Dhoulaguri and Uttar Chakuakheti. The case studies were released in the two villages by Chaitali (the ACIAR representative) and Erik, Ram and Fraser in the two villages. Subsequently, Mitali read out the cases before the community. Hard copies of cases were distributed among the community members and participants for reference. The community was quite enthused to hear stories from their own villages. They identified areas, in the respective cases, where some additional information was needed. With their inputs the community approved the cases for public sharing. The community was seen as alert as some of them offered some suggestion to include additional information to make the stories more representative. Some questions were also asked regarding events and processes as discussed in the stories. Chaitali (Assistant Manager ACIAR, Delhi) found the cases really interesting and tried to engage with the women on the activities. Mike (USQ) did not see much expression on the faces of the community. Erik Schmidt (USQ) considered the event and the process very relevant and reminded others of the importance of sharing data and information with the community as part of engagement process. Mainuddin (CSIRO) took interest and interacted with the community on the subjects/aspects of the cases. Getting the knowledge validated by the community is an essential element of ethical community engagement. The exercise further consolidated/substantiated the need. It created positive feelings among the community. A lack of visible expression among the community, as observed by some of the participants, can be attributed to a sense of disbelief –‘they are being taken into confidence and being valued’- being the first experience in their life. Over all, the exercise of taking the knowledge back to the community who are the repertoire and source of knowledge, was invaluable to place the community as the focal point of reference .